Some mums these days are going round the bend, trying to decide what to put in their children’s packed lunches. The problem is not always in choosing items your children will actually eat, but in the balancing act involved in being sure you have excluded items their school will confiscate. 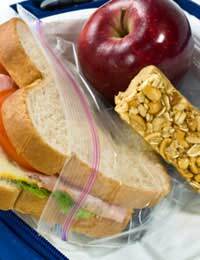 State schools, as well as some private schools, have strict rules about what you can and cannot include in a packed lunch. While parents might think these rules are fairly straightforward, they are not. The problem is made even more difficult by the fact that some schools forbid certain items – such as chocolate and biscuits – but are happy to include them as a regular part of school dinners. So what gives? Most schools have strict healthy eating policies, which seek to encourage pupils to have a well-balanced meal in the middle of their school day. These policies are formulated by drawing on guidance from the government, and taking foods from the five food groups in the right amount as indicated by the average age of the children. With this in mind, school dinners usually serve milk or water only, and ensure that the meal is healthy, varied and balanced. Schools normally offer varied menus with daily vegetarian options. This will include the right portions of starch, protein and fresh fruit and veg. It will also include (usually) nutritious puddings, which help to balance out the meal. Most schools have packed lunch policies which seek to educate parents about what types of healthy food to include, including fruit and vegetables, carbohydrate, protein, oily fish, and dairy products. Many parents consider this to be hypocritical. There is, however, a rationale behind it all. Schools say that while they can monitor the contents of school dinners, it is impossible to monitor every packed lunch that children bring to school. If a child brings crisps, for example, they are unable to ensure that they are part of a meal that is otherwise well-balanced. And if a child is allowed to bring chocolate and crisps – and only eats those two items - they know the meal is not well-balanced at all. With this in mind, they seek to ban everything not considered healthy. Children who want an occasional pudding, they say, can take school dinners – or have a sweet treat at home at the end of the day. School dinners are good value for money, and if your child enjoys what is prepared at school, you’re onto a winner. You know your child will have a hot meal every day, and it saves you the time and energy involved in making a packed lunch every morning. If your children complain that they are not allowed sweet items in their lunch, it’s up to you to explain why. And if they really don’t like watching their friends eat ice cream as part of their school dinner while they munch on a carrot, maybe it’s time they switched.